Wow what a day of competition which now sets up for a thrilling show jumping finale tomorrow. The decision of the Ground Jury and Course Designer yesterday to remove 500m and 2 fences was proven to be correct, as although mainly riders described the course to then be of 3* standard the terrain and very soft going meant it was never going to be an easy course to complete. Of the 90 starters there were only 39 clears with Jonelle Price coming closest to the optimum time, finishing 10 seconds over to propel her up to 4th. 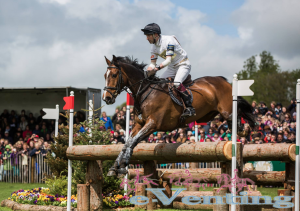 There were faults all around the course but the third water proved especially influential with the step bounce to brush fish claiming several victims including Lucy Jackson who fell with Willy Do, who demolished the fence in the process. Many horses ended up fitting in a very small stride at this fence instead of the intended bounce in order to jump clearly over. The bounce of brushes at the second water produced several incidents and near misses especially with several horses jumping over the first element to find themselves literally at the bottom of the second, with Sandra Auffarth and Aoife Clark drawing gasps from the commentators here before jumping out cleanly. For team GB all 4 team riders (Zara, William, Tina, Harry) jumped clear as did individual rider Nicola. Oliver Townend unfortunately retired after 2 stops. This leaves all the completing British riders in the top 25, with William at the head of the pack. Zara survived a few sticky moments as the pathfinder and she is quoted as saying that High Kingdom helped her enormously whilst she sat and steered! William showed his magician-worthy qualities to get Chilli Morning over the fish at the third water, which was the only notable ‘off’ moment of an otherwise very good round. De Novo News showed some really brilliant moments around the course for Tina Cook, making some of the hardest combinations look easy. Sadly we saw next to none of Harry’s round, but needless to say it was clear, and although Wild Lone tired towards the end of the course Harry will no doubt be thrilled. To say Nicola was ecstatic regarding her fantastic round with Annie Clover would be putting it mildly, and this mare is one to follow for the future despite it being her first 4*. The GB team scores currently leave them in second behind the Germans, although only after Ingrid had 20 penalties removed having originally been marked as crossing her tracks at the first water. The Australians put up a solid performance with 3 team and two individual clears to put them in third with the home nation of France and the Netherlands following in 4th and 5th, with Ireland hoping they can hold on to their 6th position overnight to clinch that all important Olympic qualifying result. The New Zealand team were perhaps the bad luck story of the day with their first four riders all failing to complete, Tim Price was clear up until two fences from home where he was pulled up by the ground jury as Wesko had run out of petrol and was deemed unsafe to continue. Mark Todd fell at the third water fish after Leonidas tripped up the step. By the time Jonelle started the team was eliminated but she flew round clear (as an Individual) and Classic Moet looked the best and freshest finishing of the day. Favourites Jock Paget and Clifton Promise picked up a runout early on at the double of corners and then quickly retired and are expected to reroute to Burghley next week. Andrew Nicholson then guided Nereo round with only 7 time penalties to finish the day in 5th. The Germans as mentioned were particularly strong with last to go Sandra Auffarth showing Opgun Louvo’s scope. She picked up 16.8 time penalties to slot in just behind leader William Fox-Pitt in the individual rankings. Michael Jung on his 9yo mare Fischerrocana FST had a few ‘moments’ but was full of praise for his horse, and only added 11.6 time penalties to his excellent dressage score to sit in 3rd. The competition is far from over, and first and foremost the horses need to pass the trot up tomorrow morning before travelling approximately an hour to Caen for the show jumping, which could affect some horses not used to travelling between phases. There were a lot of very tired horses completing and it would not be surprising to see a few not presented or potentially spun. Less than a fence separates the top 5 riders so you can guarantee it will be a nail biting finish to an already highly eventful competition. Tune back in tomorrow and be sure to watch the BBC red button coverage to see who will reign victorious. We have just heard the utterly heartbreaking news, that Wild Lone collapsed and died after the XC. Utterly devastating for Harry Meade and his team, and all connections. So very sad. R.I.P. WEG FEItv Report – is Jock being made a scapegoat? Stepping back to come forwards.